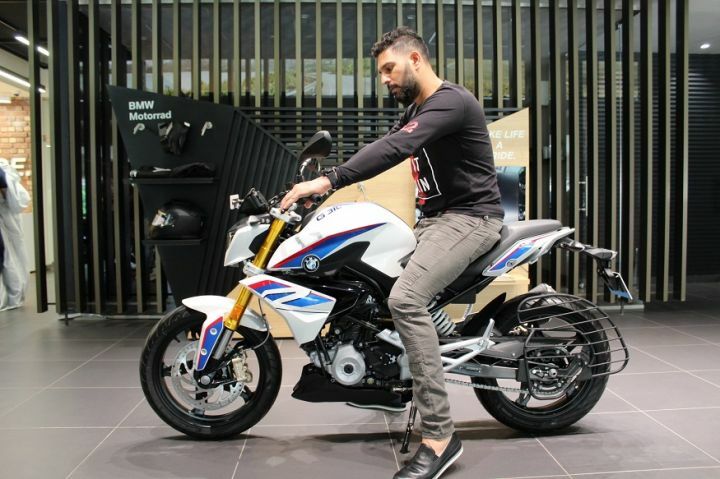 Cricketer Yuvraj Singh has taken delivery of a BMW G 310 R from BMW Krishna Automobiles, the Chandigarh dealership that caters to BMW enthusiasts residing in Punjab, making him the first celebrity to own the most affordable BMW on sale today. BMW Motorrad launched the G 310 R and G 310 GS in India in July this year. With a premium price tag of Rs 2.99 lakh, the G 310 R is undeniably the most expensive single-cylinder 300cc motorcycle on sale in India today. The made-in-India street naked shares its powerplant with the BMW G 310 GS and even the TVS Apache RR 310. The 313cc, single-cylinder, liquid-cooled motor is mated to a 6-speed gearbox and pumps out 34.4PS of power and 28Nm of peak torque. The G 310 R shares its chassis and components with the aforementioned motorcycles, including its gold-coloured USD front forks, rear monoshock, 300mm front disc and a 240mm rear disc, with ABS as standard. While the G 310 R and the TVS Apache RR 310 get a non-switchable ABS at the rear, the G 310 GS gets a switchable unit that lets riders have more fun off-road. It even offers a suspension travel of 180mm, which is 40mm and 49mm more than what the street naked offers at the front and rear, respectively. The BMW G 310 R is priced at Rs 2.99 lakh while the G 310 GS will set you back by Rs 3.49 lakh (both, ex-showroom Delhi). The German manufacturer has stated that the price is inclusive of a 3-year/unlimited kilometre warranty, which can be extended to five years as well. BMW Motorrad India is also offering roadside assistance for the two models. The BMW G 310 R rivals against the KTM 390 Duke (Rs 2.26 lakh), Bajaj Dominar 400 (Rs 1.62 lakh), the Benelli TNT 300 and the Mahindra Mojo XT300 (Rs 1.8 lakh). which of the following will be a better choice among BMW G 310 R, KTM 390 Duke & Benelli TNT 300 ? which of the following will be a better choice among BMW G 310 R, KTM 390 Duke & Benelli TNT 300 ?